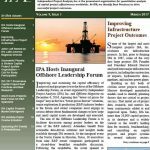 Improving and sustaining the capital efficiency of major oil and gas projects was the focus of the Offshore Leadership Forum, an event organized by Independent Project Analysis (IPA), Inc. and Offshore Magazine. The aim of the Offshore Leadership Forum is to facilitate discussion among project leaders on the state of the E&P industry. Attendees benefit from actionable data-driven solutions and insights made available through IPA research. Some of the largest and most complex projects IPA, Inc. evaluates are infrastructure projects. In fact, prior to forming IPA in 1987, some of the very first large projects IPA Founder and President Edward Merrow analyzed were major infrastructure projects, including the construction of airports, hydroelectric dams, pipelines, and nuclear power plants. IPA has evaluated hundreds of infrastructure projects with diverse scopes. IPA’s infrastructure project research is current and addresses critical topics, including contracting approaches, sustainability practices, and stakeholder alignment. Business leaders expect E&P short-cycle projects to be delivered on time and on budget and to attain the required functionality. Unfortunately, the cost outcomes for E&P short-cycle capital projects are, on average, 20 percent more expensive than the industry benchmark for the given scope of work, according to IPA’s most recent study of over 300 projects delivered by 18 companies. The annual meeting of the Industry Benchmarking Consortium (IBC) is being held March 20-23, 2017, at the Lansdowne Resort in Leesburg, Virginia. A voluntary association of owner firms in the capital intensive industries, the IBC fosters improved effectiveness of its members’ project systems, resulting in more competitive capital project outcomes. Pharmaceuticals, commodity chemicals, refining, pipeline, mining, power, and infrastructure industries will all be in attendance at this year’s meeting. Call for Study Participation: How can pharmaceutical (pharma) and biotech companies successfully organize their capital project systems in an environment with lean talent resources? A recently announced IPA study intended to identify Best Practices for confronting project organization challenges faced by pharma and biotech companies will provide answers.